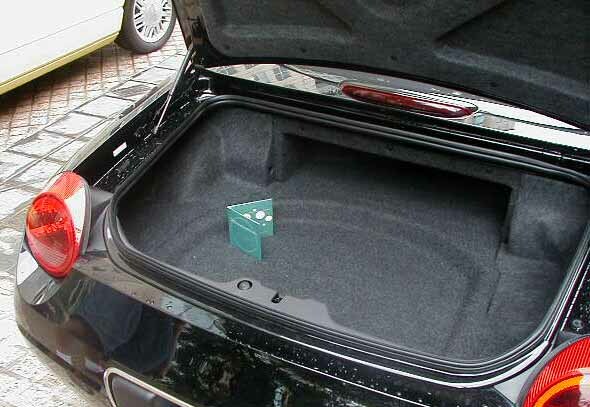 The Trunk Space -- 6.8 cubic feet of space - not a lot, but useable. Caution: because battery is in trunk, make sure there are no lose metal objects in the well and that the cover is placed over the well at all times. Have added some stereo photos (as links) so you can get a feeling for the depth. For stereo viewing instructions visit this webpage. 02 boot cover folded and stored in trunk. 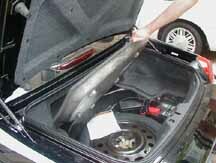 The 03-05 boot cover will fit in the cubby hole at the back of the trunk. Two Golf bags do fit but no bags with wheels will fit. You'll definitely get your exercise when you go golfing with this car. Yes, there is one in case your battery goes dead. It's located behind your driver's side seat, on the lower side of the shelf. It uses your key. If your key will not open the trunk with that lock, then you need to get it fixed as that's the only way you're going to get into your trunk if the battery goes dead. Located on the lower part of your driver's door - see owner's manual for instructions. As of January 2008 - Replacement battery is only available thru your Ford dealer or a Lincoln/Mercury dealer. 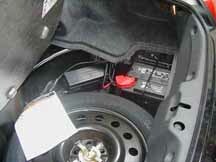 Your Thunderbird requires a vented battery due to location -- a closed trunk with no air circulation. Battery companies are telling us that there are not enough cars built to warrant making a replacement battery for your car. Do check to make sure your vent tube is hooked up properly so it will vent to the outside. 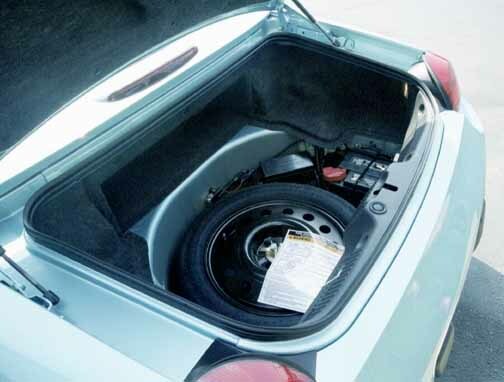 Read the trunk wheel well page before you ever have a flat. 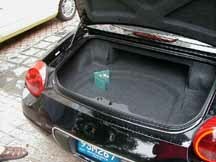 Because of the small size of this trunk, I thought it would be fun to see how you have used the space to it's best advantage when traveling. 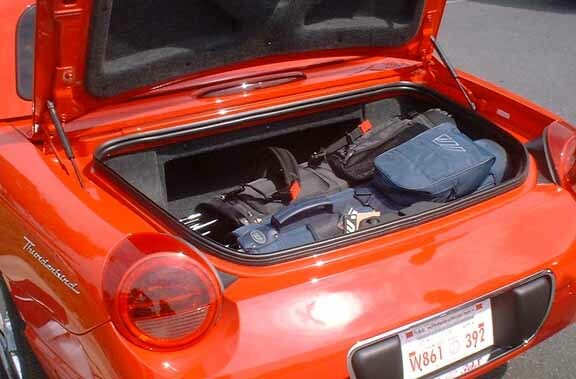 I would like to place on the net pictures of how you have packed the trunk with essentials for traveling. Email your photos to me or send me a link to where you have placed them on the net.